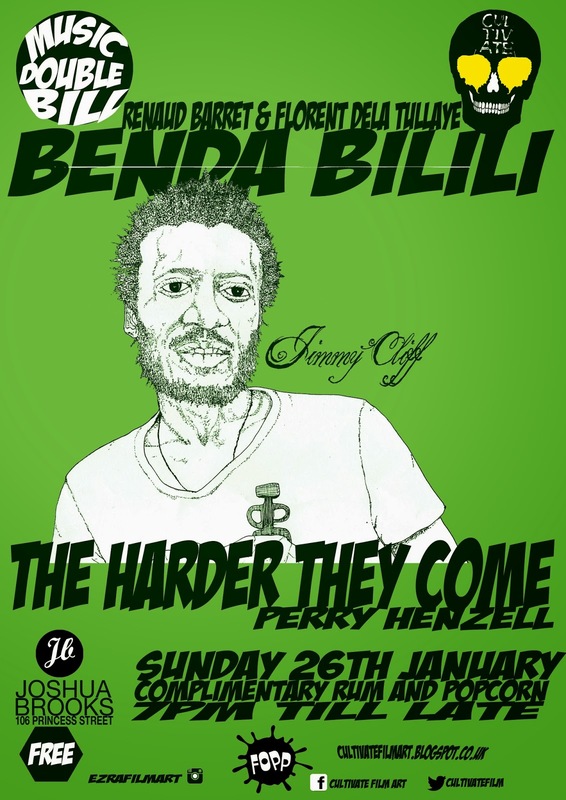 This weeks screenings’ are from Africa and Jamaica first up is BENDA BILILI a life affirming documentary about the Congolese band STAFF BENDA BILILI a group of street musicians from the Democratic Republic of the Congo. From living around the grounds of a zoo in the country's capital city, Kinshasa, and play busking to tourists to make ends meet they enchanted people with their style of music, which is rooted in traditional Congolese music with elements of rhythm ‘n’ blues and reggae The core of the band consists of four senior singers/guitarists, who are all paraplegics (they had poliomyelitis when they were young) and get around in spectacularly customized tricycles. They are backed by a younger rhythm section consisting of abandoned street children who were taken under the protection of the older members of the band. The soloist is an 18 year-old boy who plays on a homemade single stringed guitar; the group's name translates roughly as "look beyond appearances". This story of triumph through adversity will make you laugh and cry but most of all it will make you believe that nothing is impossible, a must-see whether you’re a film fan or not. Next up reggae legend Jimmy Cliff in THE HARDER THEY COME. This gritty, groundbreaking classic about the musician turned outlaw, fighting a war on two fronts one with the music industry and the other with the police. His dreams of are realised but for all the wrong reasons, a brilliantly told cautionary tale with a soundtrack to die for. SUNDAY JANUARY 26TH, FROM 7PM, WITH THE USUAL FREE POPCORN AND RUM. http://vimeo.com/20467156 CHECK OUT THE TRAILER.